Most people’s New Year’s resolutions come with some sort of desire to get fit, whether this means losing pounds, fitting in more weekly workouts, or even just getting stronger or running faster. Let’s be real, though — setting the goal is easy, but accomplishing it takes some work and effort. But with the right habits, you can make reaching your goals a bit more feasible. Here are five tips to help you meet your fitness goals in the new year. Don’t just come up with your goals in your head — write them down, too. Studies show that writing down your goals makes you 42 percent more likely to actually accomplish them. Keep your list near you or somewhere on display, and it’ll remind you what you’re working towards. 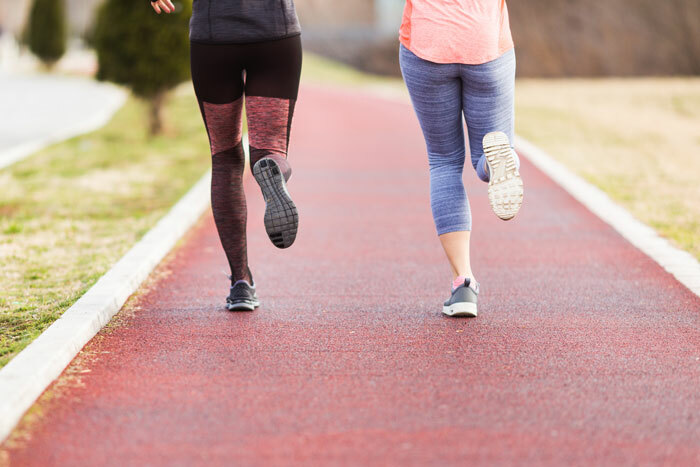 Not only is working out with a friend more fun, but it can also help push you to work even harder. Studies show that working out with a partner improves your motivation, which can help you get to the gym in the first place, but it can also improve your performance once you’re there. Participants of a study who were paired with a slightly stronger virtual exercise partner held a plank for longer compared to when they worked out alone. Sometimes life gets in the way and we don’t have time to go for that run, but start to view your workouts as a commitment. Add them to your calendar, and treat them like an appointment you can’t miss. If you don’t want to go to the gym (because we all know how packed it gets in the new year), start doing workouts at home with FabFitFunTV. From yoga to meditation and workouts for expectant moms, members can access exclusive fitness content from the world’s best fitness studios and trainers such as Burn 60, YogaWorks, Olympian Jordyn Wieber, and more. Plus, it’s so easy to access these workouts on your laptop or mobile device — perfect for when you’re on-the-go. Sign up today if you’re not a member!